For by first baby shower a few weeks ago, my friend Kelly made these wonderful Thai appetizer cups filled with a savory filling. 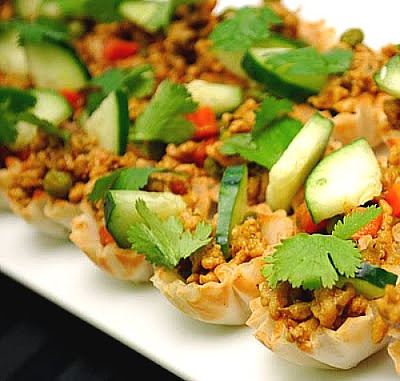 The filling was made with ground chicken and had such an amazing flavor of sweet, salty, sour and a touch of spice - the unique combination of tastes found in Thai cuisine. I just had to have the recipe since it was a great little appetizer I'd like to serve up for guests in future dinner parties. To my surprise, one ingredient I never expected was included - lemon lime soda! Thanks to Kelly for bringing them in to share and for providing her original recipe! In a skillet, saute the onion and chicken with vegetable oil until the chicken is cooked through. Add the peas and carrots along with the lemon lime soda and stir. Once the carbonation subsides, add the remaining filling ingredients except thephyllo cups. Allow the mixture to cook for 10 minutes for flavors to meld. Remove from heat and set aside to cool. The mixture should be sweet, salty, with a hint of sour from vinegar. You should be able to taste the coriander and the curry powder. Spoon the mixture into the thawed Phyllo cups, garnished with a piece of cilantro and cucumber. Serve at room temperature. wow, i love this dish! thanks for sharing the recipe...now i don't have to pay $$$ to have it at a thai restaurant!!!! it looks so easy to make as well. hope all is well with you and your pregnancy. I'm so excited to make these! Thanks for posting! what can you subsitute chicken with, i'm veggie person and don't eat meat or chicken or fish. Mitsui - you can substitute with seitan or tofu!